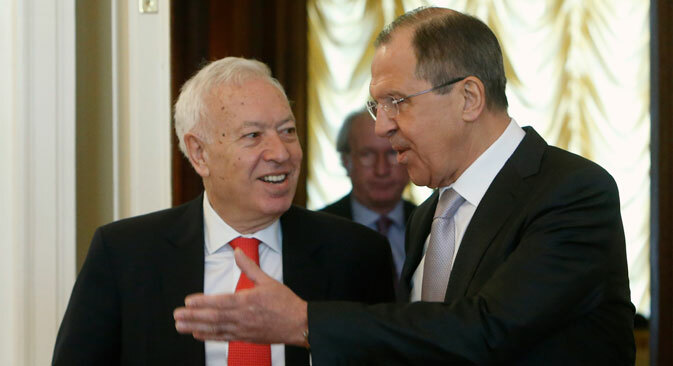 The Nezavisimaya Gazeta newspaper reported on meetings between Russian Foreign Minister Sergei Lavrov and his Spanish counterpart Jose Manuel Garcia-Margallo, which were dominated by the question of Western sanctions against Russia. According to the paper, Garcia-Margallo argued against prolonging the sanctions, saying that they are not only "disadvantageous for everyone" but also "do a lot of damage to the Spanish economy." Lavrov, for his part, suggested that the West consider the possibility of implementing sanctions not only against Russia, but also against Ukraine "in order to force the government in Kiev to carry out what was agreed on." Vladislav Belov, deputy director of the Institute of Europe at the Russian Academy of Sciences, told Nezavisimaya Gazeta that there is a major difference of perspective between the EU and the U.S. in relation to the sanctions against Russia. "The EU links the sanctions strictly to the situation in Donbass," Belov said. "[German Chancellor Angela] Merkel insists that Russia has violated international laws and must pay for it. And the sanctions will continue until the situation changes." The U.S., however, is focused on the broader geopolitical picture. "The EU will do everything so that the conflict ends as soon as possible, but the Americans are interested in its continuation. And the delivery of lethal weapons to Ukraine guarantees the conflict's escalation and thus the continuation of the sanctions," Belov said. The news website Gazeta.ru writes that the U.S. is sending 3,000 troops to the Baltic countries along with technology for strengthening their defense within the framework of NATO cooperation. The U.S. troops will be stationed in Estonia, Latvia and Lithuania, where they will carry out drills until the middle of June. After the drills are over, the military technology will remain in these countries in order to guarantee their security. The governments of the Baltic countries have previously stated that they fear possible military aggression from Russia, which could use the presence of Russian-speakers as a pretext for intervention. Russia has also recently been conducting military drills near the borders of Latvia and Estonia. In a statement to the website, Igor Korotchenko, director of the Center of Analysis of World Arms Trade called the U.S. drills in the Baltics a provocation. "The U.S. is goading the Baltic leaders to augment their political confrontation with Moscow,” said Korotchenko, while stressing that Russia has exclusively defense forces” in its northwest corner. The Moskovsky Komsomolets newspaper reports that Russia has ceased participation in the joint consultation group on the Conventional Armed Forces in Europe (CFE) treaty. Anton Mazur, the head of the Russian delegation at the talks in Vienna, said that Russia had halted its participation in the CFE talks in 2007. Leonid Ivashov, president of the International Center of Geopolitical Analysis told Moskovsky Komsomolets, "the treaty is already dead. We had maintained this group hoping that the NATO countries and Russia would work together on the new project. But there was no progress and in today's conditions we do not foresee any cooperation between NATO and Russia." Deputy Director of the Center of Political Technologies Alexei Makarkin said that there would not be any major political consequences to the end of Russia’s participation in the CFE. "Relations with the West are already poor, therefore abandoning this platform is unlikely to worsen them," said Makarkin. "The current system of agreements does not particularly suit Russia, while the West is not planning to change it. Moreover, neither of the sides believes it is an urgent problem. First they have to settle the issue in southeastern Ukraine." The CFE treaty, negotiated at the end of the Cold War, placed limits on the number of troops and conventional weapons deployed by NATO and Russia in Europe.